Wake up, demand all dolls accompany her into our bed, forgot a doll so scream about it, pat Ima's face constantly, kick Abba's tummy, demand all dolls leave the bed, no blanket, bring the blanket back, breakfast time! And that was all before 7:00 am. In all seriousness, she spent her day making the family pretend chocolate cake, playing with all her dolls, watching some Peppa Pig, oh right- and terrorizing the kitten. 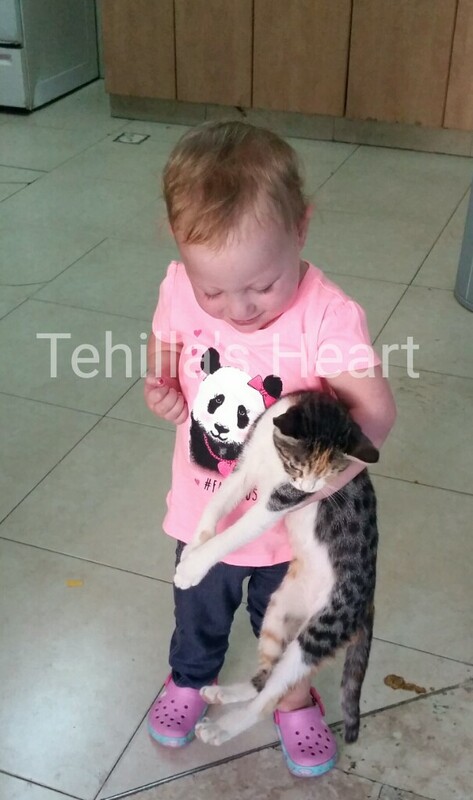 Tehilla tries to carry that poor kitten around and chases her everywhere. Her pain lessens each day and her energy increases every day. Her color is beautifully pink and unless you see her scar peak out, you'd never guess her surgery was two weeks ago. She's.gorgeous! Glad to hear her speddy recovery, Baruch HaShem! Baruch HaShem! To him be all the Glory! I am so very happy she is healing so quickly! she should continue with good health!